10. A fabulous reason to visit the beautiful North Norfolk Coast, the beaches, countryside and our great pubs and cafés! Can we cheat and add a number 11? 11. Of course there are the wonderful shops and café of Dalegate Market to visit too – All the wildlife watching equipment you need from One Stop Nature, clothing from Fat Face, accessories and jewellery from Relish, souvenirs from Gone Crabbing, art and pottery from The Hare & The Hen, everyday supplies from Keshco's, holiday house rentals from Norfolk Hideaways, not forgetting breakfast lunch and afternoon tea from Deepdale Café. The Deepdale Outdoor & Wildlife Festival is open from 10am to 4pm on both Saturday 20th and Sunday 21st April. There will be over 30 stands and a full weekend of activities with someone for everyone that has the slightest interest in the great outdoors or our amazing wildlife. 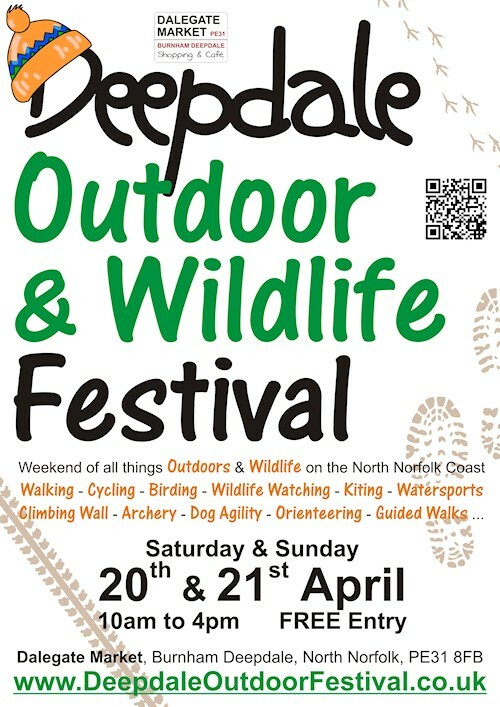 It’s easy to find the Deepdale Outdoor & Wildlife Festival, which is being held at Dalegate Market in Burnham Deepdale on the beautiful North Norfolk Coast. The site is on the main A149 coast road, approximately half way between Hunstanton and Wells-next-the-Sea, just over the hill from Burnham Market.